Founded in 2011 The Dog Adventure Company exists to help customers with so many different aspects of their dogs lives. Whether that be Dog Daycare in Lincoln where it all started or communicating with dog owners in New Zealand through our blog. 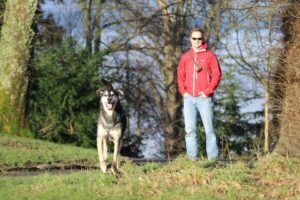 The Dog Adventure Company is family owned and operated and prides itself on a unique and personal experience for you and your dog. Steves original background was in teaching Outdoor Pursuits such as Canoeing, Climbing and Hill Walking. Then fate intervened and he got his first dog Honey Bee, the original Adventure Dog. Honey Bee was a difficult young dog with aggression and socialisation issues and so Steve looked to find ways of helping overcome her issues. It worked and Honey Bee and Steve are now a team. If you see Steve there is a fairly good chance you will see Honey Bee close by. Steve now designs all our Behavioural and Training Programs as well as trains all the staff in Dog Handling and Safety around Dogs. The original Adventure Dog. Honey Bee was taken out of a local rescue Centre, Lincolnsire Rescue Kennels by Steve in April 2007. Her approximate age at the time was 18 months old and she had aggression and anti-social issues. Honey Bee is the main reason the company exists as it was her needs and issues that gave Steve the idea for helping others. Honey Bee has been an integral part of the all training and behaviour issues that Steve has been involved with since he started this Journey back in 2007. She is leader of of our dogs and loves nothing more than a walk up a mountain and exploring new places! Charlotte first came to the attention of the Dog Adventure Company as a customer. Her Dog Tina at the time was young, boisterous and having problems socialialising. Steve took an instant like to her attitude and calm approach to people and she started working for the Dog Adventure Company in 2012. Sarah leads our puppy classes and puppy socialisation as well as our socialisation walks. Sarah has been at The Dog Adventure Centre, Lincoln since early 2017 and is an integral part of the team providing advice and guidance to many owners. Sarah is also able to do 121’s with customers and always approaches situations in a positive and relaxed manner. Laura joined us in 2018 and now operates our sister company Dog Adventure Pet Services. Offering Dog Walking, Pet Visits, Puppy Visits, Pet Sitting as well as our own Dog Adventure Days. Laura spends her days thinking of new ways to have fun with your animals and giving them all the care and attention they deserve. Joining us in 2018, Jancis brings a wealth of knowledge having completed her BSc in Animal Behaviour and currently completing her Masters in Clinical Animal Behaviour. 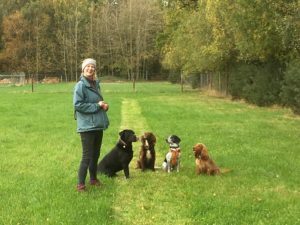 Jancis has moved into the Dog Adventure Centre to look after all the boarding dogs ensuring they have excellent facilities and a loving and caring person to look after them. Jancis runs 121 training sessions and in 2019 will be launching a new range of classes to help with behavioural problems including anti social behaviour.